Ready To Go To A Higher Level? Here's How To Ascend! Are you tired of the same old same old? Are you ready to go to a higher level? Perhaps you’re ready to go to a higher level of intimacy with God. You’re ready to become the man or woman of integrity, of prayer, of the Word, and of godly character that God has called you to be. Or perhaps you’re ready to go to a higher level of power. You’re ready to heal the sick, raise the dead, and cast out demons the way Jesus commanded us to do. Or, maybe you are ready for a higher level of success in your personal life and relationships. You’re ready for deeper friendships, a better family dynamic, and a life lived with purpose and intention so you can fully experience everything God has for you. No matter what, if you’re ready to go to a higher level in any area, God is ready to help you. Thus says the Lord, your Redeemer, the Holy One of Israel: ‘I am the Lord your God, Who teaches you to profit, Who leads you by the way you should go'” (Isaiah 48:17). I had a sudden inspiration to look up the word “profit” in my trusty Strong’s Concordance, so I did. You know what I found? I was a student of foreign languages in college. I majored in Spanish and minored in French, with some additional study of Japanese, German, and Italian thrown in. I love the beauty of foreign languages. One thing I learned, however, is that languages don’t always translate. The nuances of one language are often unique to that language, and you can’t convey the exact meaning of a word or phrase in any other language. Therefore, when you translate from one language to the next, you just have to do your best. You have to convey the general intent or thought, because you often cannot convey the literal meaning from the original text. Thus says the Lord, your Redeemer, the Holy One of Israel: ‘I am the Lord your God, Who teaches you to ascend, Who leads you by the way you should go'” (Isaiah 48:17), emphasis mine. God Himself teaches you to ascend. He is the One who takes you to a higher level. He’s ready to take you to a higher level right now! That really struck me. As Christians, we are to live “on earth as it is in Heaven.” Literally, we belong in Heaven, and we can start living there now. Heaven is open to us; it is our home. Therefore, we should be living FROM Heaven TO earth. But if you are new to this reality, you might not be sure how to get there. You want it. You’re hungry. But you need help. 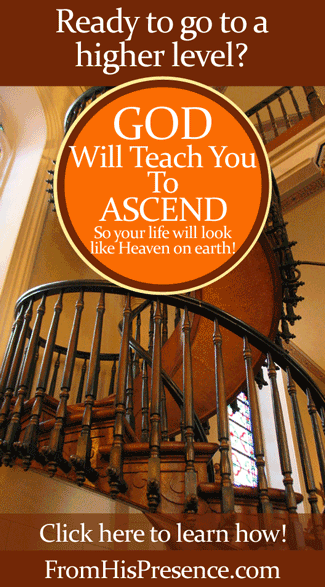 Isaiah 48:17 tells us that Jesus Christ Himself will teach you to ascend. I don’t believe He’s talking about making money here, which is kind of the way it’s translated. Based on the entirety of Jesus’ ministry and teaching on earth, I believe He’s talking about what He always talks about: living in Heaven, abiding in Him, and being one with the Father. So if you’re ready to make His reality your reality, jump on that. Jesus teaches you to ascend. He’s ready and willing to help you live the ascended lifestyle and go to the next level with Him. So go ahead and ask Him for help! This is Kingdom life, and Kingdom life is Jesus’ favorite topic. He’ll help you as soon as you ask. Are you ready to make “on earth as it is in Heaven” a reality in your life? Does this message speak to your heart today? If so, please leave a comment below! Image courtesy of Rotatebot on Wikimedia Commons via Creative Commons license. Image has been cropped and graphics added. Great message! I love when people translate and tell what scripture actually says. Thanks so much. Thank you, Susan. Thanks for reading! Hi Susan. Thank you so much sister in Christ. In Heaven we have an abundance. May we live our heavenly lives on earth. Amen. Great! What did He say when you asked? I didn’t receive an answer yet. To be honest, I have a hard time receiving answers from God. Rafael, He will speak to you and you will hear. Jesus promised. He said: “My sheep hear my voice; I know them, and they follow me.” Jesus promised that you DO hear. – When Jesus won the test in the desert , He stood on the word. He said “It is written ” . But what is interesting is verse Mathew 4:11″ …the angels came and ministered to him” after Jesus stood on the word. So even Jesus was tempted when he was standing on the word. So keep on standing on his promises not matter what and believe me angels will bring victories. This has been my experience as well. Ask Jesus to fill you and baptize you with His Holy Spirit, Kingki. Hello Jamie! It’s AMAZING you would post this today! I literally just wrote this prayer in my journal before I read your post. Thank you for confirming my request and God’s desire. Isn’t it neat how He gives us exactly what we need exactly when we need it!?? This is exactly what I’ve been talking with Him about. I’m hungry to spend personal time with Him in a much deeper way but don’t know how. Was even discussing this with a close friend and prayer partner last night. Thanks. I pray for you and your husband so keep doing what you do! Yes it really speaks to me as this is what am praying for to.go higher. Thank you Lord. Am ready. Praise God, I sensed the Lord leading to this verse years ago and a few months ago I was confessing and standing on it, and I forgot it and stopped confessing it. And this morning when I saw it my heart lept, it was like a reminder from Papa ?Our Lord is soooo good! Blessings to you Jamie. Thank you for this word from God, I am ready to ascend and have a deeper more intimate relationship with God. Yes I am ready to ascend to and I cannot wait for this, just tell me what to do. This is where I’m at right now. I’m at a place of being pregnant and getting ready to birth God’s ministry. It has been years of confirming to his image. Being aquainted with many sorrows and suffering. I’m crying asking for my spiritual child to born. I am just seeing/reading this post. It really speaks to my spirit. 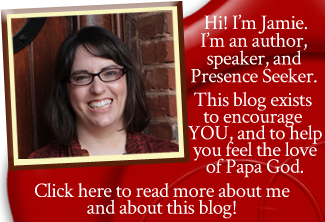 I am very encouraged by this message and many others of you. I look forward to receiving from you and Holy Spirit. Thank you for posting this…. God spoke to me yesterday telling me to go Higher. This was right on time.